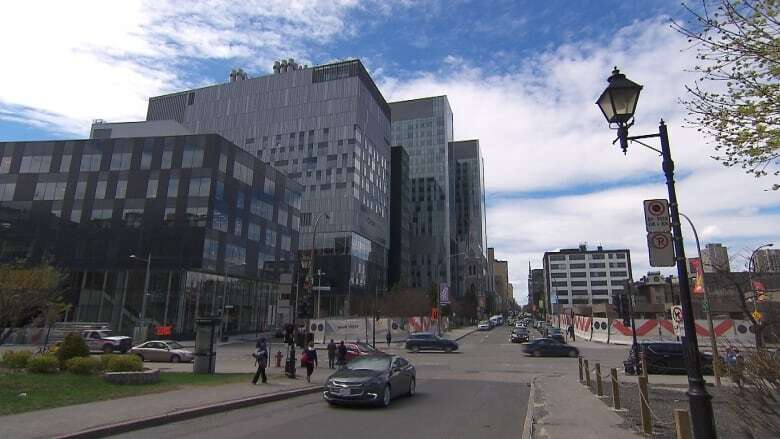 About 109 patients from Montreal’s Hôpital Saint-Luc have been moved just down the street to the new Université de Montréal hospital centre, the CHUM superhospital, today. The new Université de Montréal hospital centre (CHUM) officially opened its doors Sunday with the transfer of its first patients. About 109 patients from Montreal's Hôpital Saint-Luc were moved just down the street to the new CHUM superhospital. Patients were transferred through an indoor tunnel built between the two establishments. Hospital spokesperson Irène Marcheterre advised against using the emergency rooms at either hospital involved in today's transfer, in order to prioritize patient care. The last patient was transferred at 10:15 a.m.
Saint-Luc's emergency room was closed starting at 5 a.m., and the CHUM's opened today for the first time. "We had the first emergency patient at the CHUM this morning around 5:25 a.m.," Marcheterre said. Families seeking care were asked to avoid coming to the CHUM until after 3 p.m. The move started at 7 a.m., and the first patients — a mother and her baby — were greeted by Quebec humourist Yvon Deschamps, a former spokesperson for the CHUM foundation. "He wanted to open the door of the hospital to the new patients," Marcheterre said. Patients of all ages, including five babies, were transferred to the new superhospital. Five babies are being transferred today, along with four patients in intensive care. Patients had their health evaluated by nurses before leaving Hôpital Saint-Luc and after arriving at the CHUM, which is just a block and a half south away. Command centres were set up at each end. Close to 600 staff were on hand to make sure the move went smoothly. The Hôpital Saint-Luc, located at St-Denis Street and René-Lévesque Boulevard downtown, is slated to be demolished. A new section of the CHUM will be built in its place. This intensive transfer of patients is the first of three upcoming moves to the new superhospital — Hôtel-Dieu on St-Urbain Street and Notre-Dame on Sherbrooke Street will also have patients transferred to the new location, on Nov. 5 and Nov. 23 respectively. The $3-billion complex, located behind the current Hôpital Saint-Luc site, will absorb patients in the French-language teaching hospital network.